In this Feb. 9, 2012 photo, wounded war veteran Marine Cpl. 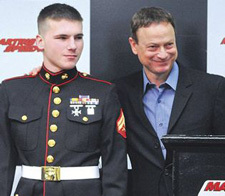 Joshua "J.B." Kerns, poses with actor Gary Sinise during a news conference in Martinsville, VA.
22-year-old Patrick County Marine Cpl. J.B. Kerns, who lost his right arm below the elbow and both his legs below the knees in an explosion in Afghanistan in 2011 during his third tour of duty. Actor Gary Sinise, famous for his role as Lt. Dan in “Forrest Gump” is raising money to build several “smart homes” for wounded veterans across the country as part of an ongoing efforts to support U.S. military personnel and first responders. The foundations partnered to create the Building For America’s Bravest program to build the homes. For Kerns, the new home will help him be more independent, but he said his disability hasn’t stopped him from living life to the fullest.